Take your pleasure or business meetings to the most remarkable level with the Philippines’ amazing array of top luxury hotels located all over the archipelago, whether you are opting for a beach, island or city setting. #1 - Amanpulo Resort & Hotel (Pamalican Island, Palawan): Amanpulo is such a beautiful piece of paradise you have been dreaming to see – where you can swim in its turquoise water under the clear blue skies as well as bask in the warm sunshine while strolling on its shores so full of powdery white sand. To top it off, besides Amanpulo’s exquisite accommodation, services and facilities, guests also have the privilege to be flown into and out of this magical island via a private plane. #2 - El Nido Resorts Pangulasian Island (Bacuit Bay, Palawan): Fall into the arms of El Nido Resorts Pangulasian Island, and you shall truly be lifted up by this Eco-Luxury Island! Adore its world-class villas with amenities like Wi-Fi access, satellite TV, iPod dock, mini-bar and coffee/tea – making facilities. Without a doubt, you will take delight, too, in this great resort’s impeccable beach and tropical forest. #3 - Raffles Makati (Makati City): Offering both sweet retreat from the busy, harried life and the perfect venue for meetings/weddings/other events, grab hold of Raffles Makati’s outstanding customer service, stylish rooms with complete amenities, as well as scrumptious dining at Spectrum, Writers Bar, etc. What is more, find your way towards their soothing spa treatments and outdoor swimming pool, to make your stay truly brilliant! #4 - Shangri-La’s Mactan Resort & Spa (Mactan Island): Celebrate your milestones here, manage your business meetings or simply relax after a week-long busy city life. 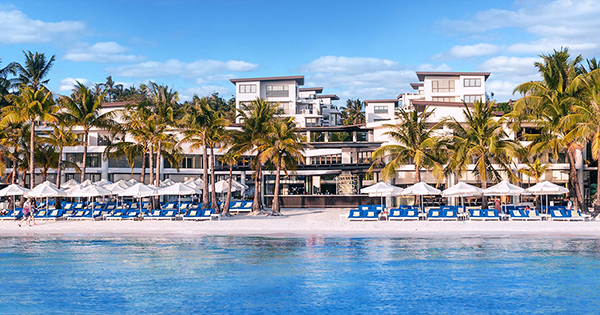 Shangri-La’s Mactan Resort & Spa has everything it takes to be called unparalleled: 6 restaurants, 2 bars, a business center, clinic, facilities for the physically challenged, a hair salon, child care, laundry service, etc. Besides, appreciate their extraordinary Ocean Wing rooms that are near the beach and a pool with breathtaking views of the sunrise. #5 - Radisson Blu Cebu (Cebu City): Radisson Blu Cebu’s light shines so bright! Who can resist its proximity to Mactan Cebu International Airport, white sand beaches and SM City Mall? In addition, enjoy their superior accommodation, events place, flavorsome dishes at Feria, al fresco swimming pool, fitness center, free Wi-Fi access, revitalizing spa, and many more! #6 - New World Makati Hotel (Makati City): High and lifted up right at the center of Makati City, New World Makati Hotel is champion in terms of its accessibility to major shopping areas, embassies and multinational corporations. Not to mention, guests can have captivating views of the city from their well-appointed suites or guestrooms, as well as get a thrill out of the delectable menu in Café 1228, Club Epicure, etc. #7 - The Peninsula Manila (Makati City): Both the locals and foreigners alike set their sights on the luxurious comfort, top-notch service and savory dining over at The Peninsula Manila – a hotel that has been operational for a whopping almost 4 decades! Head over to the Lobby for an afternoon cocktail or coffee, or better yet hold your corporate meetings there while dining in style. Additionally, grab that opportunity to do some sightseeing or shopping by riding The Peninsula Manila’s Mercedes-Benz sedan; otherwise feel adventuresome with their Jeepney tour of the city. #8 - Manila Mariott Hotel (Pasay): Just minutes away from Ninoy Aquino International Airport, Manila Mariott Hotel is swell with their lavishly decorated rooms that have got high – speed internet access, flat- screen TVs, and marble bathrooms with jetted tubs. On top of that have a good time with their amenities such as the airport shuttle, full service spa, fitness center and swimming pool. #9 - Discovery Shores Boracay (Aklan): There’s truly something about White Beach, Boracay Island that sets it apart from other beaches in the Philippines. Aside from the superb staff, accommodation, amenities and facilities from Discovery Shores Boracay, tourists will really dig this wonderful resort’s nightlife, water activities, various cuisines, powdery white sand, and fiery sunsets. #10 - Sofitel Philippine Plaza (Manila): Every guest will relish Sofitel Philippine Plaza Manila’s adjacency to Ninoy Aquino International Airport, domestic airports, SM Mall of Asia, MOA Arena, Cultural Center of the Philippines, government offices, Manila Bay, etc. Along with these, Sofitel Philippine Plaza Manila presents its 5-star accommodation and hospitality as they showcase rooms and suites that have balconies where you can view spectacular sunsets.